Tourism Minister says former PM cannot accept that his policies failed, resorts to fear-mongering to stay relevant. 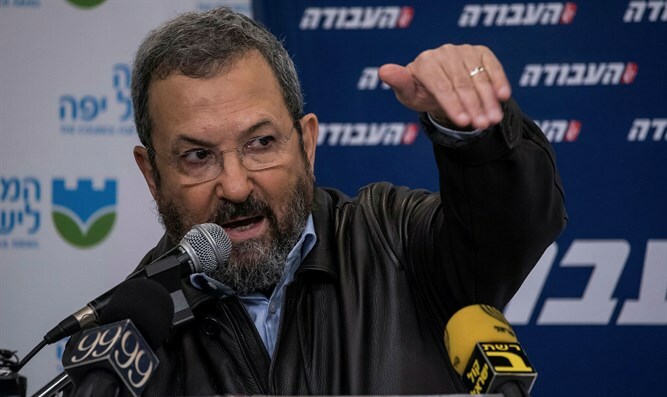 Former Prime Minister Ehud Barak reiterates his criticism of the current Israeli government and its leader, Binyamin Netanyahu, every few weeks. Tuesday night, Barak chose the Eretz Yisrael Museum in Tel Aviv as the latest venue for his accusations that the Netanyahu government is leading Israel towards the end of its existence as a Jewish and democratic state. Tourism Minister Yariv Levin dismissed former Prime Minister Barak's warnings as pure . In an interview with Arutz Sheva, Levin said that "Barak, who failed in his position, turned himself into a watcher at the gate, full of insights and advice that if we ignore him we will reach very bad places." "With Barak, the distinction between darkness and light is apparently very problematic. When he was elected prime minister, he declared that it was the dawn of a new day, but this day turned out to be a darkness of terror and a failed presidency," Levin said. "Today we are on the verge of enacting the Nationality Law, strengthening settlement, strengthening Israel's status and strengthening Israel's economic power, and he presents this as dark. I suggest not getting too excited about these things," he added. During his speech Tuesday night, Barak accused the leaders of the Coalition of pursuing "a single Jewish-messianic state and a Muslim majority of citizens and subjects requires the destruction of the foundations and institutions of the Zionist-democratic state." The Tourism Minister replied that when there are no real arguments, slogans, lies, half-truths and distorted descriptions of reality are used in their place. "We want the inheritance of our forefathers not to be abandoned by others, certainly not by those who want to expel us from the country, and therefore this goal, which they on the left has lost faith in the justice of the path and the ability to achieve results. In the eyes of the left, it is impossible, while I think that it is not only possible, but that we are also approaching its implementation." Levin noted the words of MK Musi Raz (Meretz) when he submitted a no-confidence motion this week. "He advised us on Barak's advice on an Arab peace initiative, and he also dared to criticize the government for the situation in the south. When I replied, I was shocked to hear what he had said, because we were told on the left that after we expelled the Jews from Gush Katif and northern Samaria and handed over the land of the homeland to the peace-seeking Palestinian Authority, we would have to receive peace and prosperity. But here we are suffering what we warned about, endless terrorism." "Therefore, I believe that the realization of the Zionist vision to which we strive and advance, and also in the security reality, the great light is on our way and the darkness is in positions that are contrary to justice and reality, positions held by the left." In Levin's opinion, Barak's primary motive is the desire to return to the public arena, which is intertwined with ideological positions. "The blatant manner in which things are said and the images and the willingness to move away from reality only to get a headline are a result of Barak's reminding us that he exists, and alongside this matter is the belief of himself and others in the leftist camp that despite everything that has happened to this day, they still believe that if we only expel Jews and open the gates of the country to every infiltrator and non-Jewish immigrant we will be a moral nation whose future is guaranteed and we will live in peace and peace with our neighbors." We tried to neutralize the harsh tone in Barak's words and to ask Minister Levin to address the concern expressed in his remarks about the demographic threat if there is no divorce, as Barak puts it, from the Palestinian Arabs. "These threats of a Muslim majority have been heard for decades and have been used by the left as an excuse to abandon parts of the homeland and to run away, but the reality is the opposite: the number of Jews is rising, there is immigration and Arab emigration is going on." "However, it is difficult to accept the demographic argument from those who supported former Prime Minister Ehud Olmert's desire to absorb Arabs under the heading of a limited return of refugees, since there is no greater folly than that," he said. According to Levin, all of these things are "not ideology but pure demagoguery." When the arguments are confirmed and reality proves the opposite of the left's position, they seek refuge in threats and demographic intimidation."